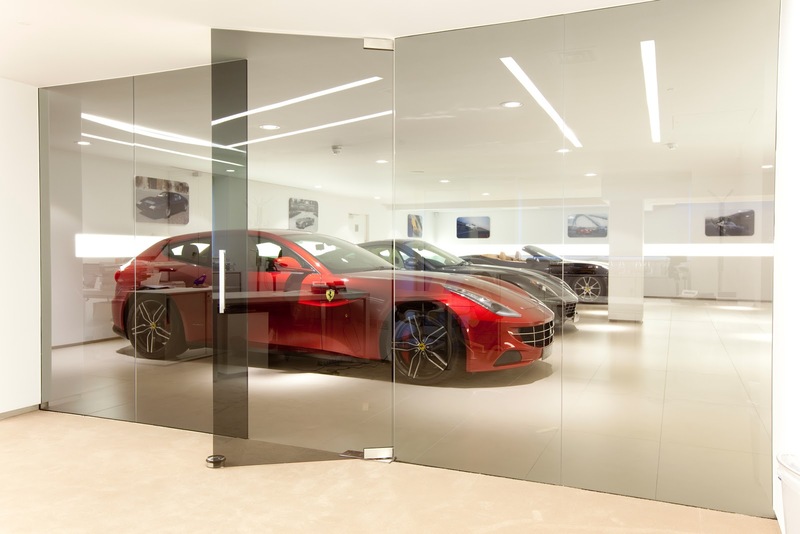 Minimalist surroundings, key lighting levels and DORMA’s sliding glass doors, patch fittings and reliable floor springs ensured that the elite refit of the Ferrari Showroom in South Kensington, proved a fitting platform to highlight its sophisticated range of cars. Incorporating all the key elements that are synonymous with the world’s most famous and iconic car brand, the refit of the HR Owen Showroom involved a complete refurbishment together with a replacement shopfront. EHW Architects specified the DORMA AGILE 150 sliding door system to provide a sleek modern finish to the spacious 810m2 showroom. In keeping with the minimalist aesthetics of the modern interior, the AGILE track which measures only 63mm high, was completely concealed in the ceiling to ensure a contemporary design. Due to the special track roller technology, the system has very little friction guaranteeing ease of operation in both opening and closing cycles, satisfying Class 3 of the BS EN 1527 standard for sliding door systems. The maintenance free carriers also incorporate effective door stops ensuring that the doors are gently de-accelerated, protecting them against accidental slamming. With the flexibility of its modular design, the DORMA AGILE 150 is the right choice for use in a space which is both of high specification and accessible to members of the public. Installing sliding glass doors to three interior sales offices and a configuration room, Martin Dimambro of Logika Glazing explained. Despite these technical challenges, the specialist team achieved the seamless ceiling through the installation of a large softwood timber beam which was suspended from the structural slab above the ceiling using wedge anchors and threaded rods. Highlighting DORMA’s glass range versatility, Universal patch fittings and BTS 75V floor springs, were also used to support a state of the art privacy glass car lift. Provided by glass manufacturer ESG, the glass system incorporates a PDLC film placed between layers of glass. When a minute electrical current is passed through the glass sheet, the opaque glass becomes virtually transparent. Due to the large size of both the doors and special nature of the system, only the most reliable and hardy of fittings could be selected. Concealed within the floor, DORMA’s BTS 75V was ideal to keep both design aesthetics minimalistic, while ensuring that with ease of opening the doorset complies with BS8300 and Approved Document M. With fixed back check, and a delayed action option available, the robust floorspring catered for all eventualities and offered both contractor and customer peace of mind. Universal patch fittings, (PT10’s, PT20’s, PT40’s), provided freedom when designing the car lift and shop front, in that every permutation for a glass door or wall can be catered for within the vast range of fittings. Thus when creating the unique lift concept and front of house façade, it was due to the reliability and functionality of DORMA’s range, that the patches for the glass were chosen. The final result was that the shop front now highlights the sleek Ferrari cars within for all prospective customers, while new owners, can have their purchase ceremonially revealed to the client using the specialised lift, offering a new visual and emotional element to the customer experience, and demonstrating what can be achieved with the high specification of DORMA products and materials used in a detailed construction process. For more information on DORMA glass systems and floor springs please visit www.dorma-show.com. All DORMA products are backed up by a nationwide team of service and maintenance engineers.